Everyone has different financial circumstances, goals and areas of expertise, so why does the majority of advice still come from poorly understood clichés? If you're starting to plan for your financial future, take a look at these top five personal finance myths to avoid. So many 'how to save money' articles simply tell people to cut out their morning coffee and buy own-brand products. This is not just obvious, it's also inefficient. Cutting non-essential spending is useful to a degree, but maximising loyalty schemes, credit card cashback and direct debit discounts can save much more than blindly slashing your budget. Maximising value is the byword, not cutting costs. 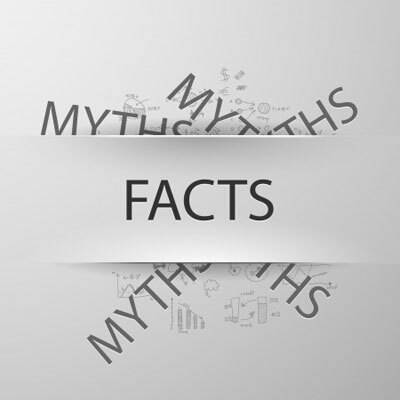 If you're thinking of investing, this myth is often trotted out to remind you that it comes at a cost. It's certainly true that you'll be risking money on financial trends, but there are two assumptions hidden here. Firstly, 'speculation' is all too often used as a synonym for 'gamble'. Although in everyday language speculate means to predict without firm evidence, in finance it means to risk a loss for a well-researched and very likely gain. Secondly, you don't actually have to take a risk to make gains from your finances. Banks and building societies offer savings accounts and ISAs with the exact goal of offering small, but guaranteed, increases in your savings, all at no extra risk to your bank balance. Find one with interest in excess of inflation, and you're accumulating without any speculation. Long periods of high inflation in the 1970s hardened a generation of finance-conscious Britons against debt, and they, in turn, trained their children to be rigorous savers. But when inflation is low, debt is cheap, and it's possible to sensibly invest in assets that may increase in value at a far greater rate than debt accumulates, rather than squirrelling away funds in a stagnant savings account. Search out the best loans before interest rates rise, and put the extra cash towards meeting your life goals a little earlier than planned. If only it were that simple. Stock market pricing is completely relative. A historic peak may be an anomaly rather than the norm, so while prices may seem low now, they could actually be correctly priced - or even still on the way down. Remember: the past is not always a good indicator of future performance. The other risk with this advice is that beginner investors get sucked into the gambler's fallacy, i.e. that a share price is either 'due a rise' or 'ready to fall'. In fact, how long a share price has been at a certain level is of no relevance in deciding which way the price will go. That's what market research and balance sheet analyses are for. Economic growth is complex, and whether broad economic trends will fit your setup depends on a lot of factors. We talk about this in more detail elsewhere, but broadly speaking, rising interest rates are good for savers, bad for those in debt, good for those invested in stocks, and bad for those who chose the 'safety' of bonds. That's why it's crucial to stay on top of your finances by using tools like the free budgeting software from Money Dashboard, which helps you build budgets specifically tailored to your situation - not powered by pure cliché. Have you received another misguided piece of personal finance advice? Let us know in the comments section below!